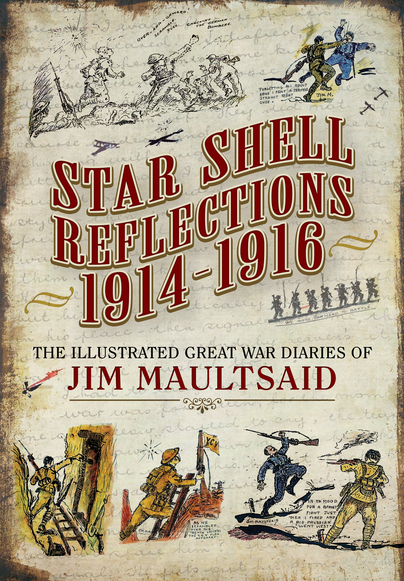 You'll be £25.00 closer to your next £10.00 credit when you purchase Star Shell Reflections 1914-1916. What's this? As the centenary of the Great War approaches, this book offers a unique perspective told in the words and illustrations of someone who was there , on the front line. Although an American citizen, Jim Maultsaid's parents were Irish and he lived in Donegal. He joined the Young Citizen Volunteers, a group drawn from the ranks of clerical and professional society, at the outbreak of war. Jim's personal style of writing is engaging, and along with his sketches and illustrations, which are witty at times, takes the reader on a journey through not only the dark days and misery but also reveals the gritty humour that helped him and his 'chums' cope with the horrors of life in the trenches. The first volume, which dates between 1914-1916, is now published and will no doubt be of very considerable interest. It is a useful reminder amidst all the war events, strategies and statistics that ordinary soldiers and officers were at the heart of this terrible conflict and that, like many others, Maultsaid found humour amidst the horror and bottled and preserved it. This book has great historical and educational value, and will give those of all ages a real understanding of how this brave generation faced war, and how they struggled to survive. ... It is a delightfully illustrated book, Maultsaid had a rare talent that enabled him to record events in sketches and in words. The sketches are of excellent quality and some are in colour, some were done in the moment and others were created later from sketches made at the time. The text is divided into short sections with bold headlines that I found off putting to begin with. However, these short paragraphs are well written and knit together to tell the story and I was soon reading it as a whole narrative. Every word has earned its place in the text and the overall effect is one of an illustrated magazine. ... This book is a valuable, visual record of Army life on the Western Front. He created more front line sketches than a photographer could produce. He went where the photographers of the day could not go, recording what he saw and he did it ‘on the spur of the moment’ and with a spontaneity that the war time photographers could not match, in much the same way that we use our digital phone cameras now. The first of a planned three volumes featuring the diary of Jim Maultsaid, born in Pennsylvania in 1893 of Irish parents, who returned to Donegal and then to Belfast where he joined the British Army in 1914. Wounded on the 1st July 1916 and declared unfit for active duty, Maultsaid was commissioned in 1917 and worked with the Chinese Labour Corps until 1920. The book contains his original diary notations and his sketches and drawings, which he expanded upon after the war to form a unique and original diary, published now for the first time in full colour. In the closest thing we have to a first-hand account of WW1 almost 100 years since its end, Jim Maultsaid's detailed diary provides an insightful perspective on the conflict. An insightful and extremely rare perspective on an era that has almost faded completely from living memory.